TORONTO — The Toronto Raptors will have to do it the hard way, again. 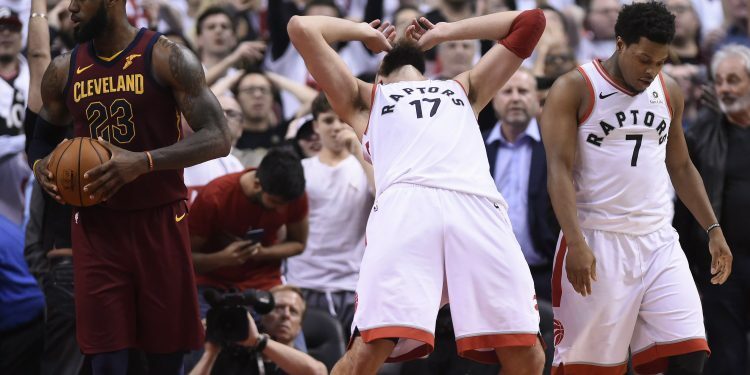 After leading by as many as 14 after the first quarter and 13 midway through the third, the Raptors shot 5-for-24 in the fourth quarter — including 0-for-5 in the final 10 seconds of regulation — before losing 113-112 to the Cleveland Cavaliers in overtime of Game 1 of the Eastern Conference Semifinals. For much of the game, Toronto looked the better team, the top seeded team in the conference, showed what many hoped to see from the Raptors coming into this series. For seven straight years, LeBron James has grown accustomed to an unimpeded path to the NBA Finals. The Boston Celtics, Atlanta Hawks, Chicago Bulls or even these Raptors have all tried and failed, while the Indiana Pacers have arguably come closest with both their Paul George and post-Paul George eras. Combining the past two post-seasons, the Raptors had lost six straight playoff games coming to this series. The first time around, James boldly stated that a 2-2 series wasn’t an adverse situation for him, and then fake sipped a beer and munched popcorn from the sidelines on the second go around. He had no respect for the Raptors and they didn’t give him a reason to. With just under five minutes remaining in the second quarter and the Raptors nursing a 10-point lead, Fred VanVleet tried to send the unofficial message that his team isn’t the same one that was swept out of the second round a year ago. As LeBron James looked to gain inside position after picking out J.R. Smith left elbow extended for a three-pointer, VanVleet tried to deter Cleveland’s Superman as he tried to gain inside position for a rebound. James didn’t take too kindly to it, and swatted away at VanVleet as though he were a fly. Sensing the disrespect, the usually calm and composed Steady Freddy came unhinged and tried to force his way through teammates to have a go at the league’s best player. VanVleet’s shove had the potential to be symbolic. Here was an undrafted player who emerged as a key cog in the Raptors’ machine showing that the they weren’t here to be pushed around, to be chewed up and spat back out as they had in years past. Toronto led by 10 at the time, and were playing the style that attracted so many new believers to them on this occasion. That wasn’t the only time the Raptors showed no fear. First, OG Anunoby showed he was up to the Herculean task of defending James, so strong that he was able to maneuver where James operated from. Right at the start of the second quarter, both Pascal Siakam and C.J. Miles sandwiched James to ensure he didn’t receive the inbounds and did it several other times as well. Siakam then lived in James’s jersey, refusing him any airspace. Anunoby and Siakam are plenty athletic, but while one mixed it with strength, the other did it with speed. It was a fascinating watch that resulted in what James himself considered his worst performance of the playoffs. He was limited to 12-of-30 shooting and 1-of-8 shooting from beyond the arc. That he still finished with 26 points, 11 rebounds, 13 assists, two blocks and a steal shows just how special he is. After a series against the Indiana Pacers in which he carried the lion’s share of the workload with his teammates barely making a contribution, he finally received some support. J.R. Smith shot 15-for-60 from deep in the first round, but made 5-of-6 in this one. Despite three points and six rebounds through his first six games, Tristan Thompson has found life with 15 points and 10 rebounds in their Game 7 victory and contributed 14 points and 12 rebounds in this win. Thompson’s contributions were perhaps most crucial as he helped cool off a Jonas Valanciunas who had arguably the greatest night of his career. He finished with 21 points and 21 rebounds, the first ever 20-20 game in franchise history, and bullied Kevin Love right from the tip-off. However, after a 13-point third quarter, Thompson held him to 1-for-7 shooting in the fourth. It can be said that Valanciunas missed a couple of easy ones, but the Canadian probably made the Lithuanian mindful enough of his presence to force those rushed shots. Then, there was Kyle Korver, too. Five of his seven field goals were triples and the other two were with his foot on the line. The Cavaliers ran stagger screens for James that essentially made the Raptors pick their poison, and they chose to hedge and trap the ball handler before rotating over. The Cavs moved the ball with purpose out of those traps and found shooters, and the Raptors will need to address these coverages before Game 2. So, you had a double-double for Thompson, 10 triples between Smith and Korver, and James with another triple-double. On a night where everyone was looking for the Raptors to be different, it was Cleveland’s old guard that made the difference. In those little moments that separate winners from losers, the Cavs were better. The Raptors are striving to be champions, and are trying to learn on the fly. They’ll have to take these lessons and be better for it in Game 2. If not, an 0-2 deficit with three to play in Cleveland awaits, and more disrespect as well.